Law Professor Robin Fretwell Wilson is in search of highly motivated undergraduate students who are interested in the law to assist with outreach, pa rticipant recruitment, communications, and social media for The Tolerance Means Dialogues. 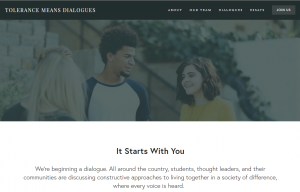 This funded series of dialogues around the country is aimed towards finding creative and constructive approaches to bridging difference in our society over issues that have divided us, like gay rights—with the goal being that every voice is heard. Occasional lunch meetings (food provided) with Prof. Wilson and members of her Tolerance Means Dialogue team at the Law School. A weekly conference call with other members with the team. Working with the team to devise recruitment and outreach strategies. Other tasks as determined to help advance this project. If you are interested, please email your resume to Carla Gall, Office Manager (holt3@illinois.edu), with “Tolerance Internship” in the subject line by 9am on Friday, August 24. Monday, Sept. 3.